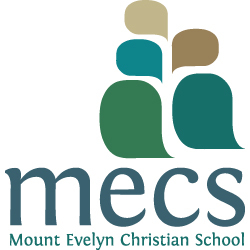 Today – finally – is the launch of the new MECS brand. Initially the project was part uni assignment that I coupled with a pitch and managed to get the job! For the last little while I have been working on their signage and stationery and as soon as I get given copies, and the signs are put up – I will share some photos. Note to the locals: I’m not responsible for the car stickers or the open day signs… just the other stuff. An abstraction of three people in conversation, this ties in with both a community focus and home-school partnership. A tree, representative of growth and suitable for the Yarra Ranges environment. Pathways, indicative of MECS providing direction and leading students through their time at school. And to a lesser extent the addition of five colours is reflective of 5 values (which I cannot pull off the top of my head at this very moment). The logo has undergone several transitions from where I left it and a huge number from where it started. The one submitted to uni used an entirely different typeface and was one-colour, the placement was also closer to the secondary vertical version. The typeface in use now is Fontin it suits the school better than the previous one, it also makes my life easier because it is of superior quality and can be used more widely. This morning the school had a brief morning tea to officially kick off the branding. I am really happy with the outcome, it feels right for the school. Here’s to hoping I get to dig my hands into their website in the next few months. In the mean-time I have picked up another job doing a website revamp for a pharmacy. I am not sure if I have talked much about concluding my time working at Ergo Consulting. I am in the handover process and will be finished by the end of March it seems the timing is really good. I’ve loved working with Ergo and learnt a huge amount while I’ve been there – not only in administration/design but about the business world. They are exceptional people to work for. This year however, I need to focus on uni a bit more and want to keep doing this freelancing stuff to get some experience under my belt. On the design note, I have also just finished the Business Sustainability Round Table website (Work through Ergo) – the focus of all my IE complaints via Twitter of late. The fun area is in the member section (Which you aren’t allowed to go to!) and I got to dig around and make useful various plugins and php. I also created the BSRT logo – the pyramid is to do with some business model/a leaf shape for sustainability, the ’round’ bit is quite literal for ’round table’, you could say it is globe’ish too, but that could be taking things a bit far. A brochure is currently getting printed, photos to come of that too. yay! finally get to see it! i’ve seen the banners hangning around the traps of the local area. looks great- fabulous job bec!!! Oh good! Glad the silly oval thing on the old logo will be long gone. Nice to see the influnce behind the look too. And also a great bit to put in your folio (or whatever you design kids call it) for prospective jobs.